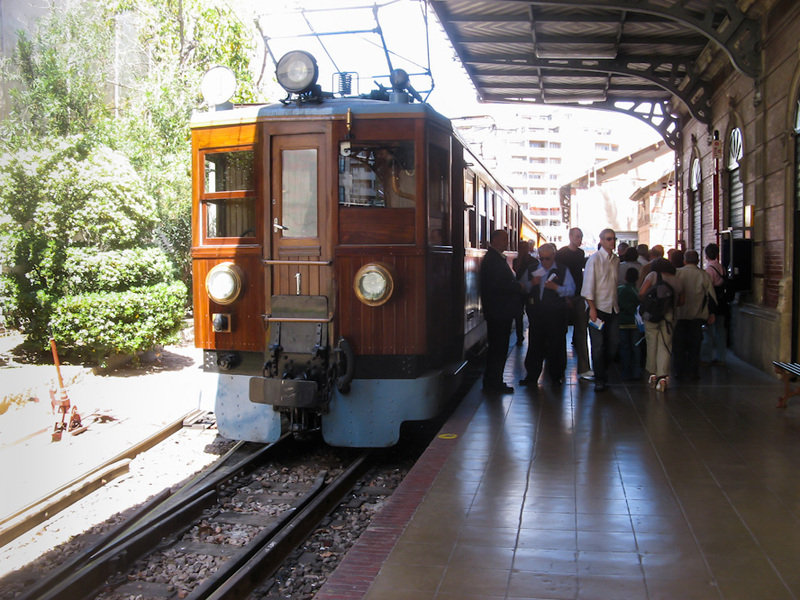 April 16th, 1912 was the date of the first ever train journey between Palma and Sóller. Today marks the one hundredth anniversary of that inaugural trip (see photo bottom). When the railway line was built, the always clever Mallorcans were listo (smart) enough to resort to a trick. The length of the line from Palma to Sóller was only 27.3 kilometers but should have been a minimum of 30 km to qualify for some state subsidies. Hence, the construction of an additional 4.9 kilometer track was begun at the same time, linking Sóller to Port de Sóller. A trip on the old carriages through beautiful Mallorcan landscape including 13 tunnels is recommended, even if a bit pricey. You could consider a one-way trip to Sóller on the Centenary train and come back on the bus. 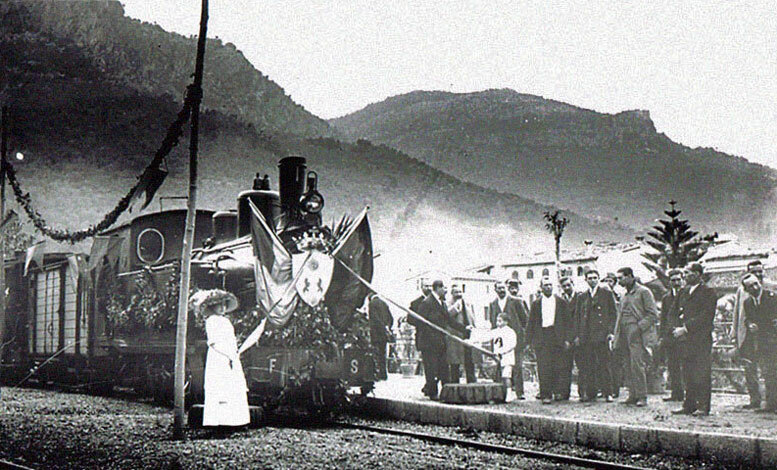 A commemorative act will be celebrated tonight at 19h00 in Sóller’s Estació de tren. The photo (top) was chosen from my archive. It was taken in Palma, Mallorca, Baleares, Spain. The date: April 11th, 2008. The time was 16:59:43. The photo (bottom) was borrowed from the Internet, courtesy of canprunera.com. I really like the old photograph and would quite like to know exactly what the little boy is holding. i don’t really know what to say. i imagine it is a strip of cloth like a banner or banderole that would be torn or otherwise removed by the train once in motion. you could ask someone at the Ferrocarril de Sóller S.A. railway company (info@trendesoller.com), they might better know how to answer your curiosity. an interesting feature worth noting is that some of the railway cars used between Sóller and Port de Sóller are actually original street cars from San Francisco. thank you, peter, for the information. i may be wrong but i think that this is a myth, though. as far as i know the three motor trams, numbered 1 to 3, and their trailers 5 and 6 are originals, dating from 1912, ordered from zaragoza/spain. the open ‘jardinera’ trailers were acquired from palma trams in 1954. there are also five motor trams from lisbon/portugal, numbered 20 to 24 and re-gauged to fit the 914 mm track gauge (this is what trendesoller.com says, and they should know). who knows, perhaps the motor trams from lisbon originally came from san francisco?